This is a die-cut Tide Water Associated porcelain sign. This particular Tide Water Associated sign is black with white text. 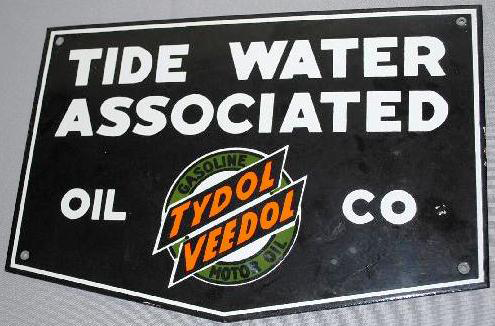 It reads, “Tide Water Associated Oil Co, Tydol Veedol Gasoline, Motor Oil” and features a green and orange Tydol Veedol emblem at the bottom of the sign.